There has only ever been one oil well drilled in the Arctic National Wildlife Refuge. It was an exploratory well drilled in 1985-86, and the results have been a closely-held secret ever since. 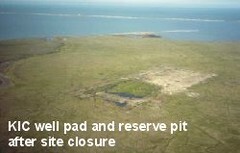 The attached photo shows what the drilling site looked like in 1990. Obviously, there was a fair amount of disturbance to the tundra. As described here, the test well was made possible by an interesting land exchange. In 1983, the federal government transfered title to subsurface rights beneath Kaktovic Inupiat Corporation village lands (hence the "KIC" name) to the Arctic Slope Regional Corporation, a for-profit native Eskimo company. The corporation then leased the lands to Chevron and BP, which allowed them to drill the exploratory well in 1985. Located about 13 miles southeast of Kaktovic, KIC-1 was drilled three miles down at a cost of $40 million. "Only a handful of people know what's down the KIC well," BP spokesman Ronnie Chappell told the Associated Press in 2001. "They've never talked about it. I'm not even sure who they are." One of them might be Oliver Leavitt, chairman of the board of the Arctic Slope Regional Corporation. The company still owns the site of KIC-1, so it stands to make a bundle if the refuge is ever opened to drilling. Writing in Indian Country Today recently, Leavitt framed revenues from ANWR drilling as key to the education and well-being of Alaskan natives. "I do not want any young Alaska Natives to be forced to choose between a high school education and practicing a subsistence culture among his or her people," he wrote. Today KIC-1 is marked only by a rusty iron pole stabbed into the tundra. The native corporation and the oil companies won a lawsuit in 1991 allowing them to keep the drilling results a secret. "Rarely has such a fundamental political battle been waged with so little information," AP reporter Joseph Verrengia noted insightfully in 2001.